Three planets have been discovered orbiting a star just 54 light years from Earth by robotic exoplanet hunters, tracing out the wobbles of stars over time. 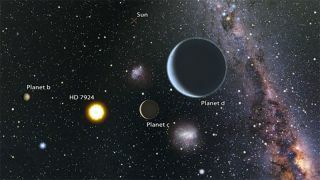 The Automated Planet Finder (APF) telescope at Lick Observatory in California, the WM Keck observatory in Hawaii, and the Automatic Photometric Telescope at Fairborn Observatory in California combined forces to examine the orbit of the planets over several years, then verify the discovery with measurements of the brightness of their parent star - HD 7924. The APF is a dedicated facility that robotically hunts for planets every night that the sky is clear. "We initially used APF like a regular telescope, staying up all night searching star to star. But the idea of letting a computer take the graveyard shift was more appealing after months of little sleep. So we wrote software to replace ourselves with a robot," said University of Hawaii graduate student BJ Fulton, who lead the search. The planetary system that the robots found is very unlike our own solar system. Their masses are seven or eight times greater than the mass of Earth, and they orbit far closer to their star than Mercury - the closest planet to the Sun. Fulton will continue hunting for more planets in Earth's cosmic neighborhood over the next few years. "When the survey is complete we will have a census of small planets orbiting sun-like stars within approximately 100 light-years of Earth," he said. The team's work was published in the Astrophysical Journal.